The snow is gone and the sun is shining longer each day. I love warmer weather! I love being able to go outside more with our dogs and I love it when it’s better grilling weather. We’ve had a few good weekends with the #smithpuppies (yes, that’s their official hashtag) and I thought ya’ll might have fun seeing some of the photos. 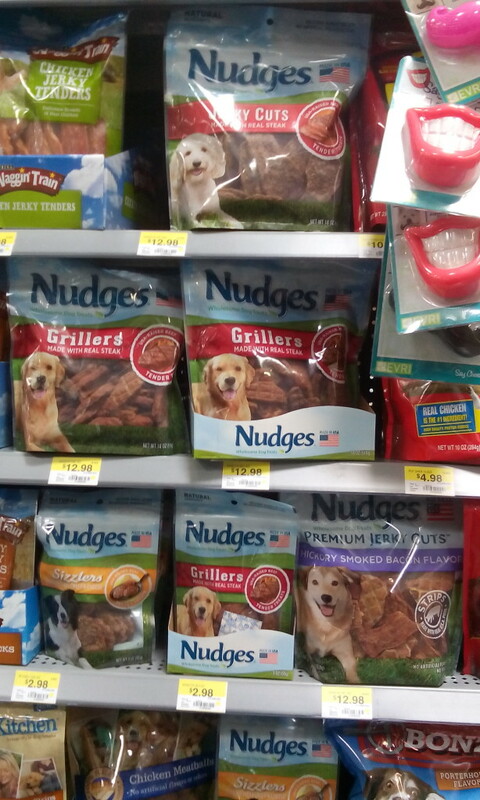 We also got to try some new Nudges Dog Treats that just came out. 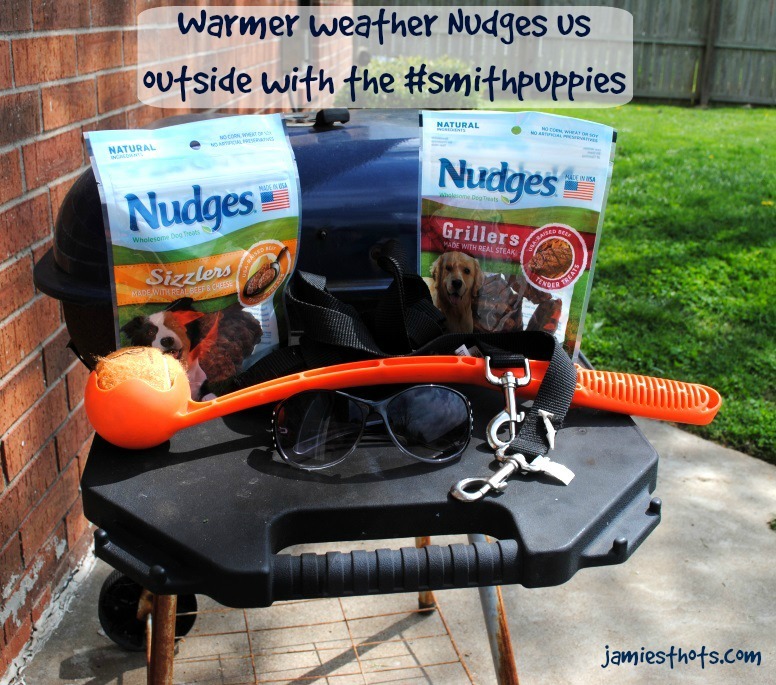 We tried the original Nudges last year and our dogs go nuts over them. The new Grillers and Sizzlers are even more amazing! Check out what we’ve been up to and read a few of my tips for being prepared for more glorious outside time with your beloved woof baby. 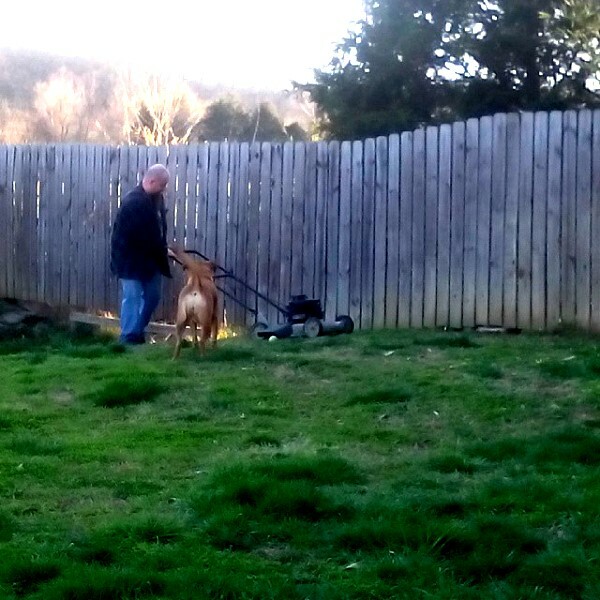 A couple weekends ago, John tackled the jungle that was our lawn. 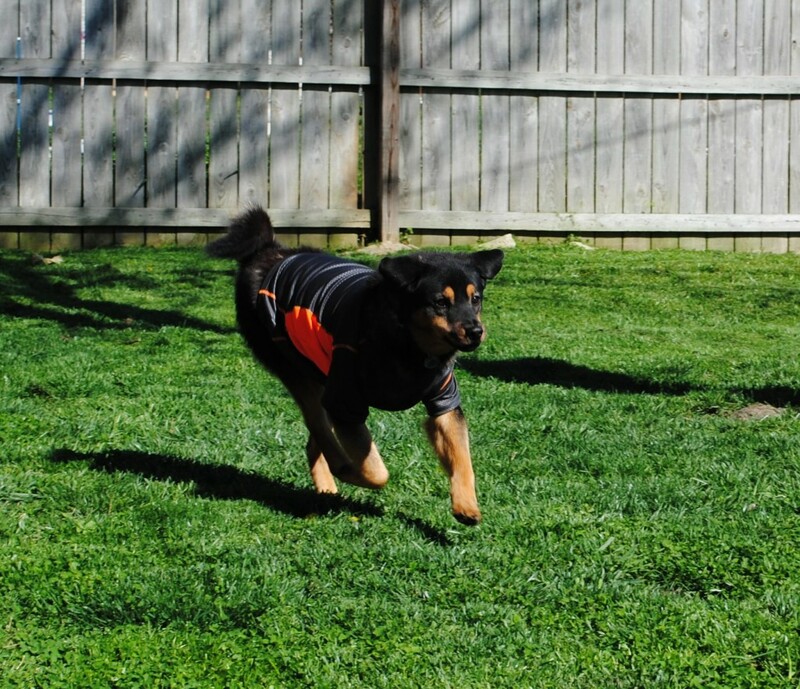 Keeping the lawn mowed helps keep bugs more at bay and also makes it safer for running dogs so they don’t slip! Notice Jazzy following John as he mows. She seems to be convinced that him going up and down rows in the yard means he wants to play! One quick note about your yard: be aware of ground-dwelling pests like ground-dwelling wasps. 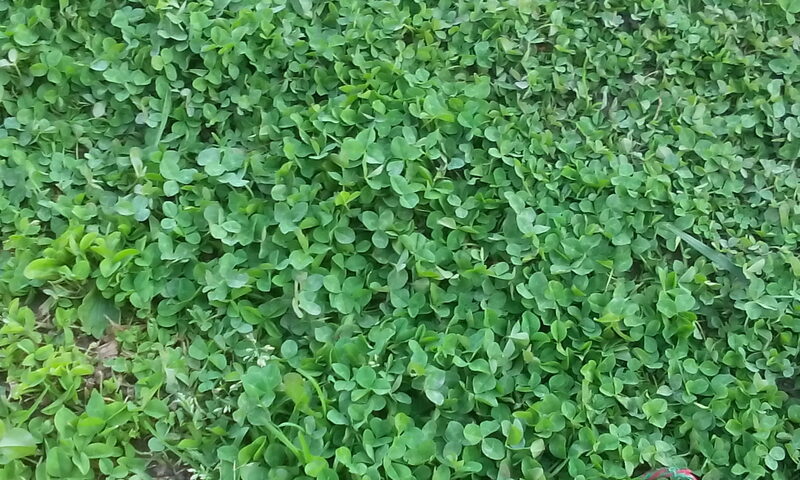 They love clover patches like this. We had to take Flower to the vet a couple of years ago because she got stung about four times in the snout when she discovered a wasp nest. Once you have your yard safe and cleaned, it’s play time! 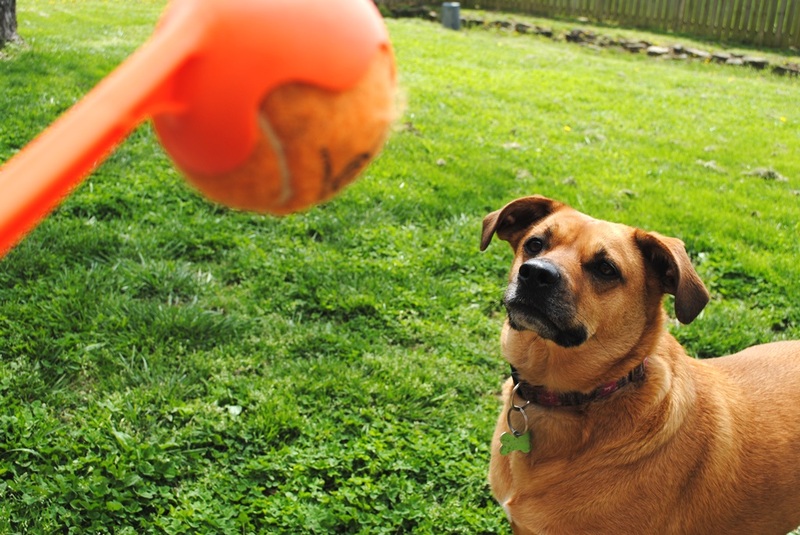 Of course for Jazzy, any time is fetch time. Here’s proof that Jazzy does actually need to rest. In the warmer months she does wear down a bit quicker. We always make sure to have plenty of fresh water available for the dogs outside. Another thing that is a good idea when getting ready for “outside season” is to make sure your fence and yard are safe and secure. This is especially important if your dogs have a tendency to try and get out to visit neighborhood buddies or if they jump the fence when scared of storms. We went to Lowe’s a few weeks ago to get things for the house and yard. 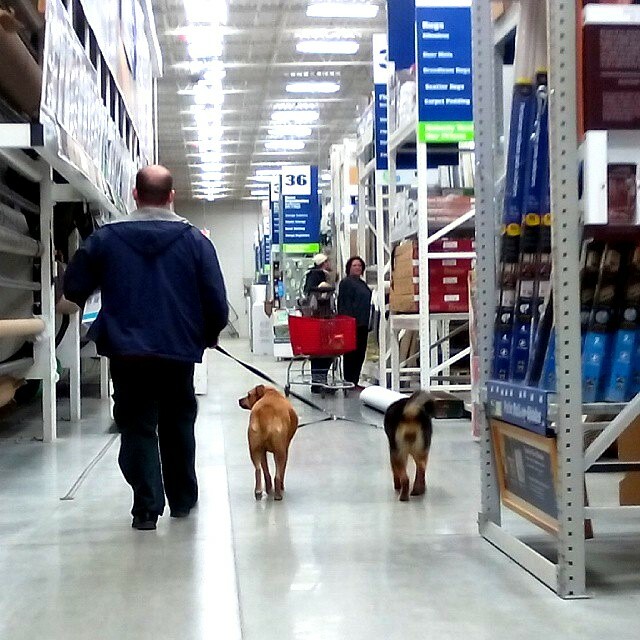 Most Lowe’s and Home Depots let you bring well-behaved, leashed dogs to the store. The #Smithpuppies love visiting Lowe’s! They always get lots of attention. Flower also loves playing outside but she’s more of a stick chewing, ball stealing, barking at the neighbors kind of dog. One quick note about Flower-you’ll notice she’s wearing a shirt in several of these photos. She had surgery a couple weeks ago and to keep her safe and healthy, we make her wear the shirt. It protects her incision sites from her (or any of the other animals) from messing with the stitches. Flower loves running between the fences to bark at the neighbor dogs on both sides. Flower loves grabbing sticks of any size in the yard. I’ve even seen her grab and drag a branch from a tree we had to have removed. 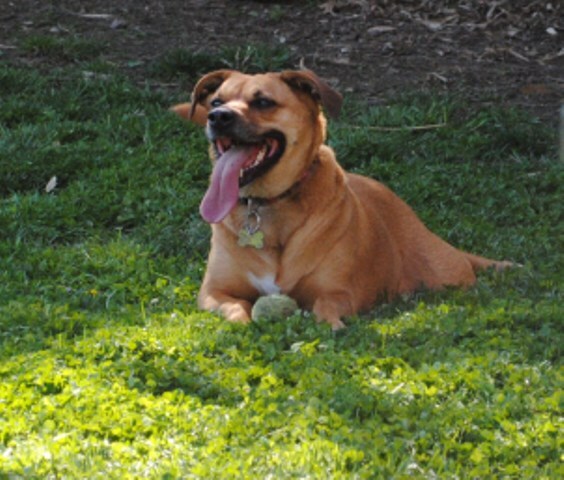 We also plan to get out to several public events that are dog friendly this spring and summer. 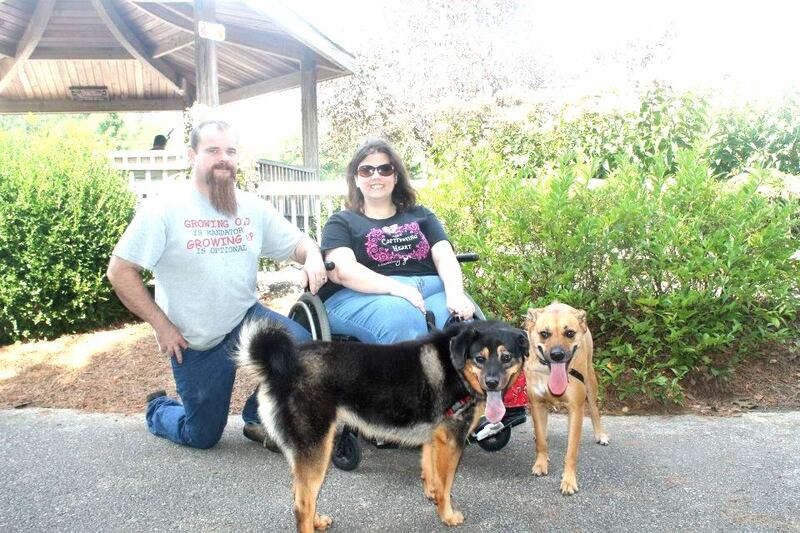 This photo is from last year’s Fayetteville Animal Services Adopters Reunion. That’s the shelter where we got both Flower and Jazzy so we try to support them in any way we can! (By the way, this is what Flower looks like without that shirt. She’s the dark dog on the left). Another favorite part about the warmer months is the grilling! We’ve been known to grill all year long but the warmer months are so much more fun. We make it a whole family event with the dogs and cats hanging outside with John at the grill and I’m usually inside making the side items. We also enjoy eating outside! 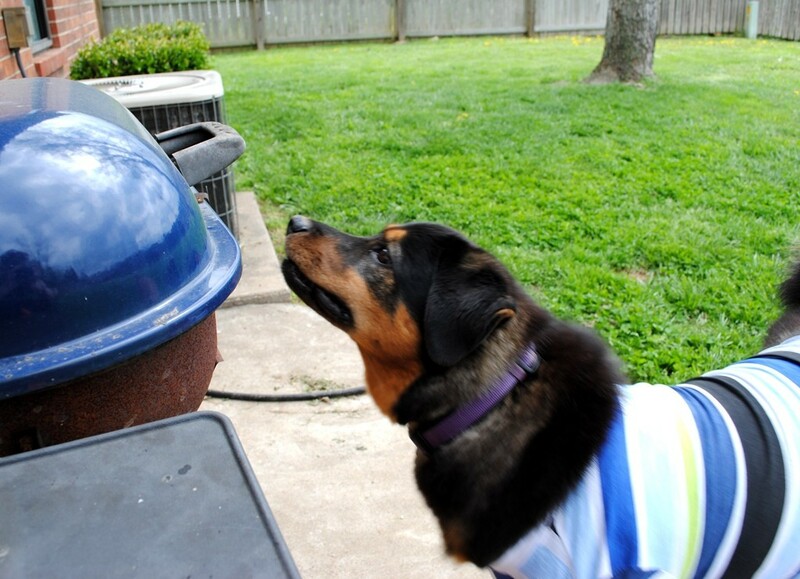 Something to be careful about when grilling is pets that might want to steal the yummy smelling food. This is really dangerous because that grill is hot! Our vet always talks to us about good nutrition for our pets and we are committed to making sure they have healthy food and snacks at all times, including items that are “meat-first” in their ingredients. I’ll admit, I got into the habit of giving them some people food that our vet said is “sub-optimal nutrition.” That’s why I’m glad that the #Smithpuppies love Nudges Dog Treats so much! They are preservative free and made from all-natural ingredients. They are also easy to tear so using them as a training tool for multiple dogs is easy. I love being able to provide our dogs with treats that are natural and taste good to them. 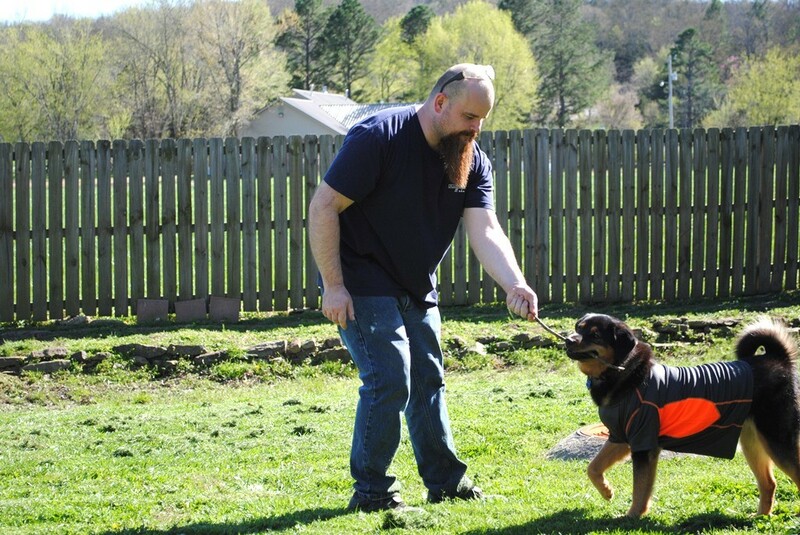 It’s our way of training them so they are safe and our way of simply rewarding them for being wonderful companions. 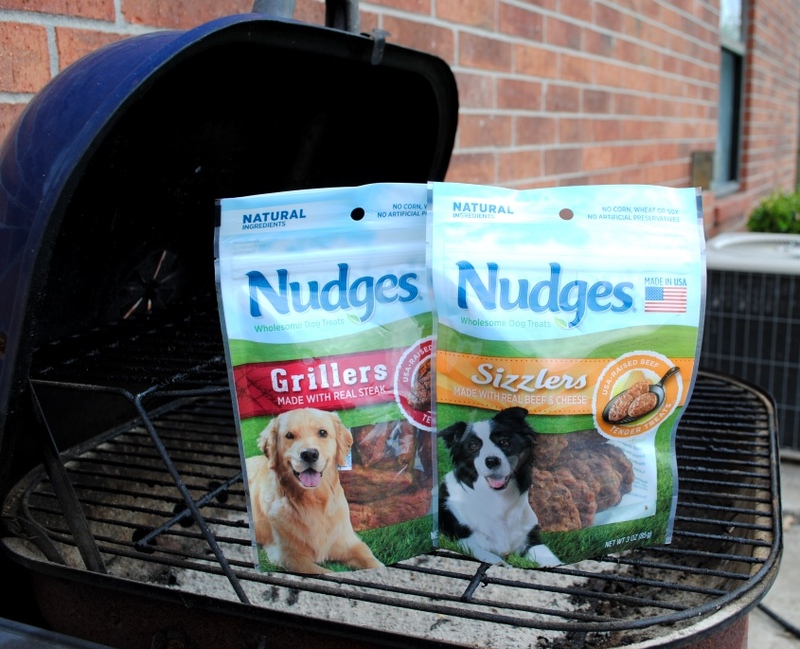 Nudges just came out with new products called Grillers and Sizzlers. The Grillers are shaped like cuts of steak and to me the Sizzlers look like little hamburger patties. You can even see the “grill” lines on the pieces! The #Smithpuppies did not want to wait for their Nudges Sizzler piece. Chicken Bacon (3oz & 18oz) and Beef & Cheese (3oz & 18oz). They also have new Jerky Cuts if that’s more your dog’s preference. You may have noticed that I used the #NudgeThemBack hashtag at the beginning of this post. You can see how other people “Nudge back” their dogs and also order Nudges Grillers and Sizzlers at this website. 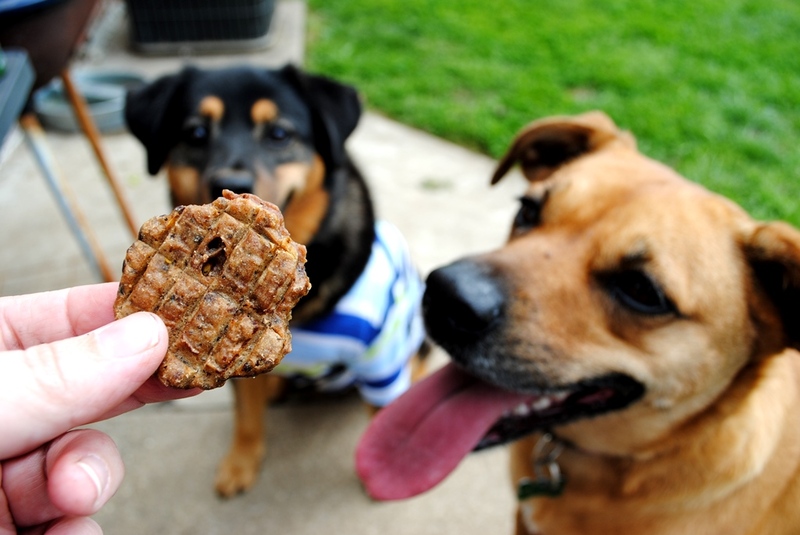 You can also learn more about Nudges in general at the Nudges Dog Treats website. I also enjoy following Nudges on Facebook (really cute pictures!). I’m curious, what do you do outside with your pets? How do you reward them for being wonderful? As I close, one more shot of the #smithpuppies. We love our outdoor time but they also love cuddling on the couch and resting after a hard day’s play. You have a Jazzy too! That’s awesome! It’s so great to have two dogs so they have each other. I agree. We got our dogs about three months apart and they have been best friends since the day we brought Jazzy home (we got Flower first). She likes to follow us around and fall down before our feet for attention, so we will pet her. When we take scraps to the chickens (fruit and veggies scraps-optimal nutrition for my hennies) she like to follow. It’s down hill to the chickies, and so…up hill back to our house. She also enjoys hanging around my huband while he grills. She is not a lap cat, though–just doesn’t like laps. So, to spoil her a bit, hubs fetches another lawn chair for her to sit on, and then pets her from that distance. I just got a new pup this past week… she’s perfect. 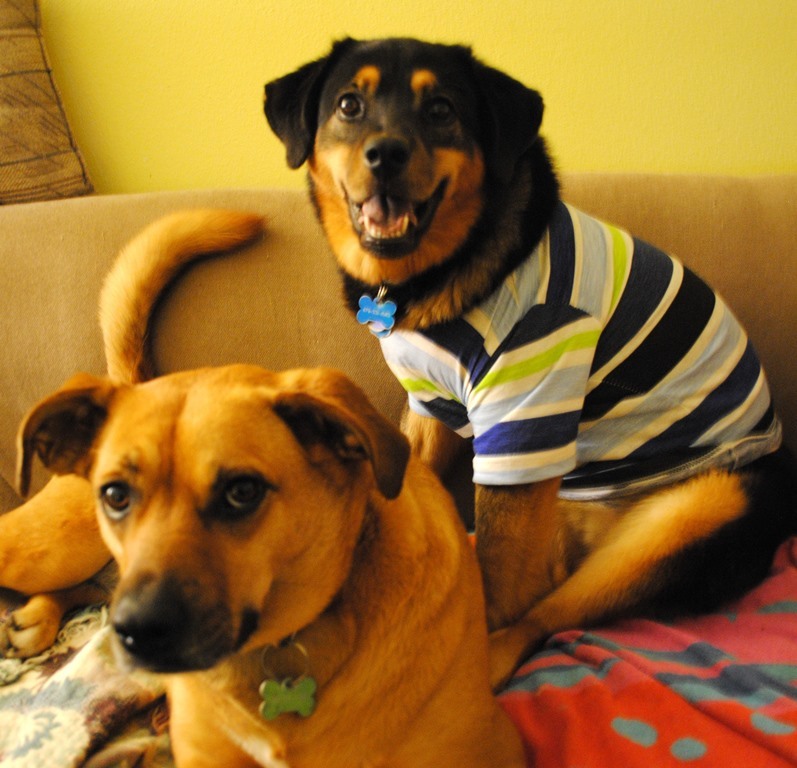 I love spoiling my animals (dogs and cats alike!) with awesome treats and food, so I’m definitely going to be on the lookout for Nudges at the grocery store.